In any business, a customer is not less than god. Undoubtedly, it is imperative to keep your god (in the form of your customer) happy. Now how to keep your customer happy is a question that is central to almost all the businesses. There are umpteen people who seek advices of successful businessmen and financial gurus to solve the mystery. With the aid of surveys to their customer base and numerical scale questions, it has become simpler for various businesses to assess different aspects of a customer’s experience (transactional surveys), or their overall experience with the company (relationship surveys). 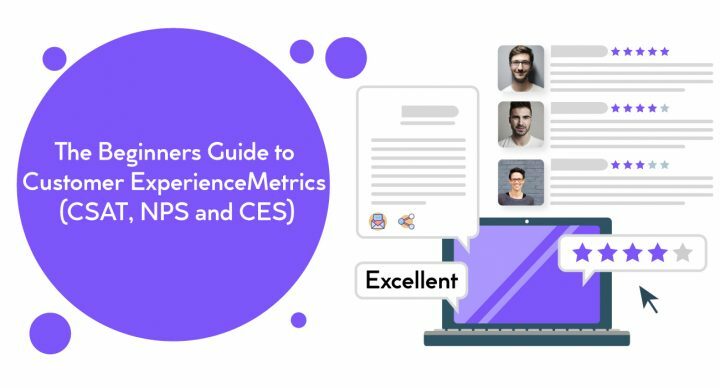 There is a multitude of customer experience metrics available in the market. However, picking the best of them is again a daunting task, especially if someone has zilch knowledge about these metrics. CSAT stands for Customer Satisfaction Score and it is one of the most commonly used metrics to measure customer satisfaction. As the name is self-explanatory, this is a CX metric that directly measures customer satisfaction levels. Under CSAT surveys, usually one question is posed by the organizations to gauge the satisfaction level of their clients with a certain product or service. This question is: How would you rate your overall satisfaction with the service received? Respondents rate their responses on a scale of 1-5. The closer the number is to 5, the more satisfied the customers of the company are. There could be variations in terms of the scale or the method of calculation. Some companies may use a 3-point scale, 7-point scale, or a 10-point scale. The CSAT score is an average based on the results of the survey. Generally, these scores are expressed in a percentage – from 0% to 100%. Here’s a Smooth way to calculate a CSAT customer satisfaction score – take the number of “Satisfied” respondents (those who answer in the “Satisfied-Very Satisfied” range, or similar parameters), divide it by the number of responses you got to the survey, and multiply it by 100.So, if 100 people respond to your survey, and 80 of them are “Satisfied,” that means you’d have an 80% CSAT score. NPS throws one question to those who are undertaking their surveys: How likely are you to recommend [company X] to a friend or colleague? Detractors: These are those clients who have given you the rating in between 0 to 6 and are unhappy with your product/service and could toss at any point of time. Passives: These are those clients who have given you the rating in between 7 and 8. They like your product/service but don’t “love” it yet to promote it. Promoters: These are those clients who have given you the rating in between 9 and 10. These clients love your product/services and will actively promote it by recommending it further. You can calculate your NPS score by subtracting the percentage of Detractors from the percentage of Promoters (Net Promoter Score = % Promoters – % Detractors). However, you can also use specialized NPS software to determine the same or send the surveys manually and then compiling the score by using an NPS calculator. CES stands for Customer Effort Score. It could be defined as a metric that is used to measure customer satisfaction levels by paying attention on the efforts customers make to interact with your business’ services and products. The purpose of the survey is to help companies find out if their customers have a hard time performing certain actions when interacting with your brand and take the necessary actions according to the survey data to streamline processes. The key question posed under the survey is: How much effort did you have to expend to handle your request? The respondents then respond on the scale of 1 to 5, whereby 1 is for low effort and 5 for very high effort. If the scaling is lower and more towards 1, it is a sign that the customer satisfaction levels are quite decent for your brand since clients have an easy time using your services/products. If the scaling is higher and more towards 5, it is a sign that the customer satisfaction levels are low as they had a hard time using your services/products. The collected customer feedback is then analyzed to find the average. In the end, all three metrics aim at removing obstructions that may come in between making your business reach the epitome of success. CSAT, NPS or CES, whichever you choose, analyze your business type well and then make a call.